Sarah Bryant: "Big Jump Press is the imprint of Sarah Bryant. Under this name, I produce letterpress printed artists’ books, prints, broadsides, and hand-bound books. I started Big Jump in 2005 in Tuscaloosa, Alabama while an MFA student at the University of Alabama." Brighton, United Kingdom: Big Jump Press, 2012. Edition of 75. 4.25 x 7.25"; 28 pages. Drum leaf in slipcase. Letterpress printed on Zerkall paper. Type is Adobe Garamond. Edition of 75: 10 deluxe; 65 standard. Deluxe : Numbered 1-10 (Out of Print). Housed in clamshell box with one of the ten objects featured within the text. 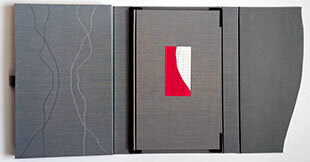 Each box is constructed to accommodate a different object; therefore, the ten copies of the deluxe edition will be slightly different depths. 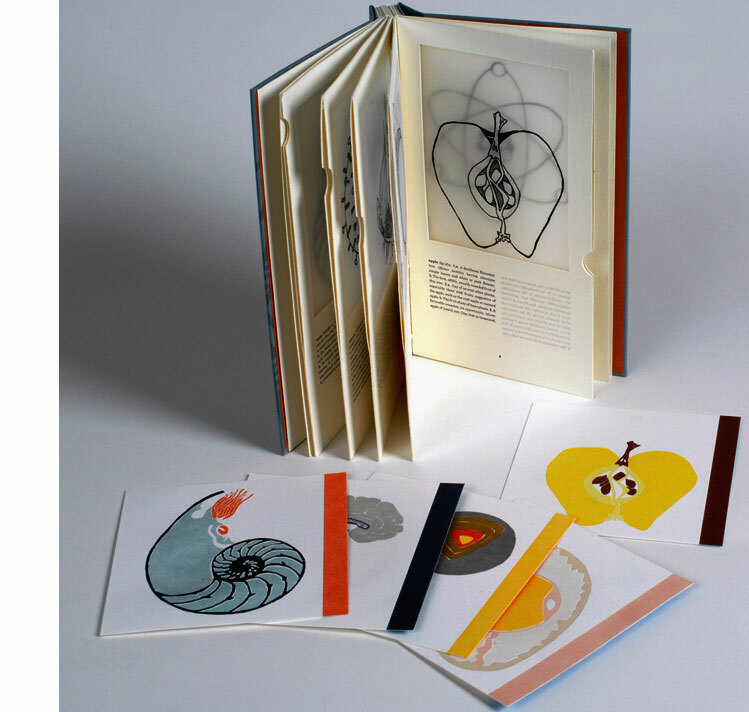 Ten prints are housed in a paper wrapper alongside the book. Standard: Numbered 11-75. Bound in cloth boards with paper inset on front board. Slipcased. Cloth covered sides with paper top and bottom edges. Sarah Bryant: "Fond is an investigation of memory and archive as manifested by the small, valueless objects that individuals collect and preserve. These objects, casually assembled over the course of years, serve as an information retrieval system and an emotional bank. A fond is a collection of documents organically accumulated by a person or institution. Using halftone photographs, color silhouettes, and a winding rope of text, I constructed a history of several objects. "I produced Fond over the course of 2011-2012 while I moved from Upstate New York to Alabama and finally to the United Kingdom." Gordo, Alabama: Big Jump Press, 2008. Edition of 100. 5 x 7"; gatefold structure. Letterpress printed from polymer plates and Perpetua metal type on Arches Text and Wyndstone Vellum. [N.B. The colophon says the transparent material is Chartham Natural Clear, but this is wrong. Bryant's Creative Thesis cites many problems with Wyndstone Vellum: "I apparently hated this material to such a degree that I didn't even want it in my colophon, accidentally citing a paper I had used in some earlier mockups as the transparent material for the book."]. Endsheets: Fabriano Ingres. Casebound: German flatback case with 6mm joint. Cloth bound, blind stamped. 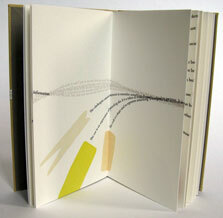 Sarah Bryant: "An exploration of one moment and location, one position in space and time. This book was designed, printed and bound over the course of two years....If all goes according to plan, this book should satisfy my thesis requirements for the MFA in Book Arts from The University of Alabama." "Objectives: When I embarked on this project in the spring of 2007, I started with a series of simple guidelines. 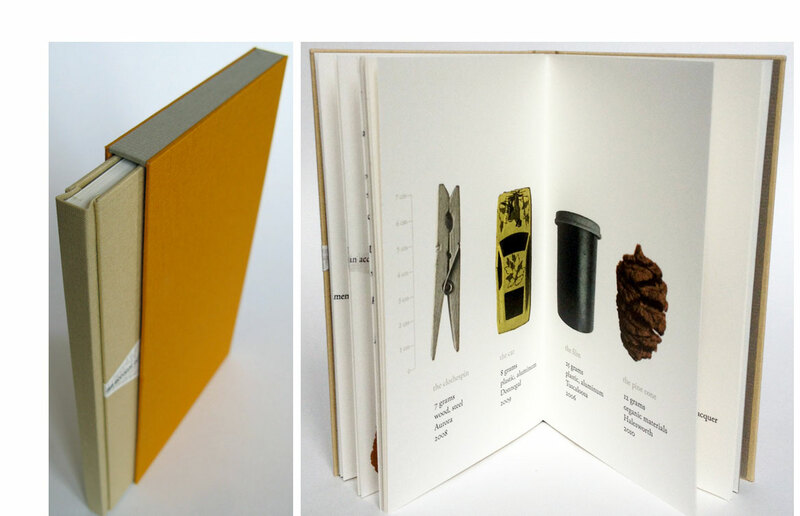 I wanted to incorporate the structural device of the dissection plate into a book that dealt with a person's relationship to their immediate, everyday environment. I wanted to create a book with a relatively simple binding in a significantly larger edition than my other books, printed in editions of 45. I wanted to work primarily with imagery, using text sparingly.
" The theme of the book would be our perception of the relationships of the groups of people that surround us. These groups would be the subjects of the dissections. The book would focus on one moment and position in space. Four spreads would function as views from a central point, as if the viewer were standing in one place and turning 360 degrees, 90 degrees at a time. The translucent layers would include diagrammatical imagery, color, and text. "Determining the text: ... I decided on a combination of two text systems. First I inserted a small amount of text that indicated direct (printed in black) and overheard (printed in gray) dialogue. It is my hope that using dialogue places this book in a moment and an environment, and helps to set up the idea of being aware, sometimes inadvertently, of the immediate environment; of being an observer and eavesdropper. The second system, punctuation, gives an abstract indication of the relationships between the groups of people in the book. I used ampersands, ellipses, brackets and asterisks: punctuation whose basic function is to indicate that something is missing or anticipated. Brackets include and exclude. Asterisks highlight something unusual or important, and ask you to seek an explanation elsewhere. It is my hope that the punctuation sets up a system of classification that highlights themes of inclusion and isolation." Aurora, New York: Big Jump Press, 2010. Edition of 75. 5.5 x 8.75 x .75"; 26 pages. 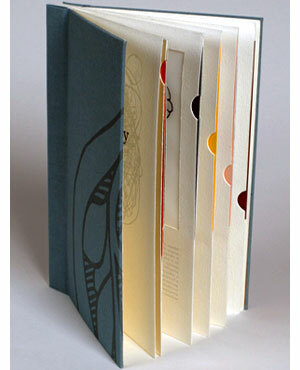 Twelve spreads (including title, colophon, and an unfolding spread near the center). Letterpress printed on Zerkall Book Vellum. Quarter bound as a hard cover drumleaf with one unfolding spread near the center. Housed in a clamshell box. Gordo, Alabama: Big Jump Press, 2007. Edition of 45. 5.25 x 8.25 x .75"; 14 pages. Printed on mylar, Rives BFK, and Hahnemuhle Copperplate. Text set in Century Schoolbook and printed from polymer plates. 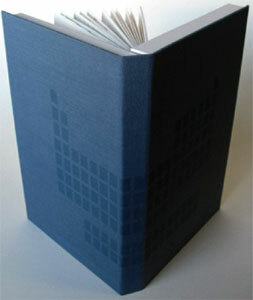 Bound in cloth-covered boards and housed in a cloth-covered slipcase. A puzzling book, so meticulously crafted that it carries the sense that something important is happening; however, what that something is is not obvious. Designed to suggest a dictionary (each page seems to have a finger index tab), but with a single image and corresponding word-plus-definitions per page. The top portion of each page has an image, a slice or cross-section of an object, outlined in black on mylar. 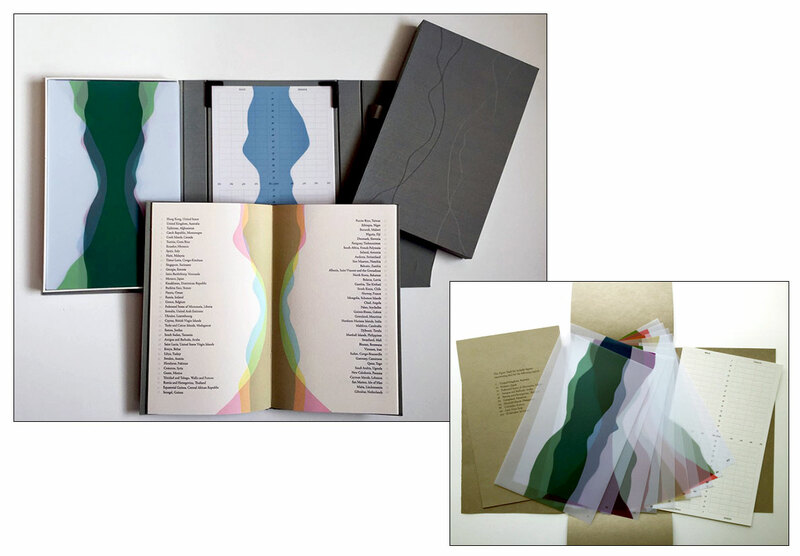 The pages are of double thickness and in between the sheet is a removable card that gives the image color. Beneath each object is very dictionary-like text: pronunciation key and list of definitions. But some of the definitions don't fit: the brain as "the lair of a burrowing animal"? Adjacent to the definitions is lightly printed reversed text that turns out to be the definitions of the work on the backing page. The words: shell, trunk, brain, influenza, earth, bulb, egg, tide, apple, atom. Like a list you give to creative writing students: make a story. Correspondences? Resemblance? Wittgenstein's fuzzy categories? How format suggests genre and genre guides – or determines – our expectations and thus our thinking? This work plays with our need to make sense of things, and our human facility for seeing patterns. Brighton, United Kingdom: Big Jump Press, 2015. Edition of 35. 11 x 7 x 1.25" closed, 11 x 21 x .75" open; 134 pages including drafting film sheets. Letterpress printed from polymer plates and linoleum on drafting film and Arches Velin paper. Housed in cloth covered wraparound cover. Signed by Bryant and Allen. Numbered. Sarah Bryant: "I produce books that examine both our physical composition and our social anxieties; our dry assessment of our environment and our emotional connection to those surroundings. I use diagrammatic imagery and text derived from reference materials to convey these ideas. Analytical imagery is critical to how we imagine ourselves and the world around us, and how we relay that understanding to others. I am interested in the simplicity of this language, which allows for slight variations in line, color and format to describe a great variety of different systems; the movement of peoples, changes in climate, the progress of disease. This flexibility speaks to our need to connect, to find patterns, and to place ourselves in a world we can understand and explain. "Figure Study is a collaborative project with David Allen, Visiting Assistant Professor in the Biology Department at Middlebury College. This book enables a quick and compelling comparison of population data for every region on earth. Using estimates prepared by the US Census Bureau, which are available through their International Data Base, we created population pyramids for every region and paired them up to create abstracted human forms. A thick-waisted form indicates two populations with a large older population that lives to quite advanced age. Narrow-waisted figures represent the combination of two populations with very few elderly people. Asymmetrical bulges to the left or right indicate a higher male or female population for particular age segments. 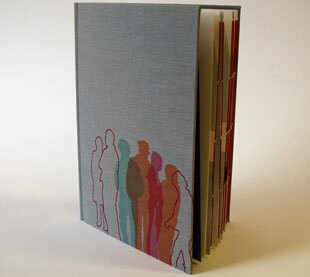 "All 114 of these figures have been printed from linoleum onto drafting film and are housed together alongside a grid. 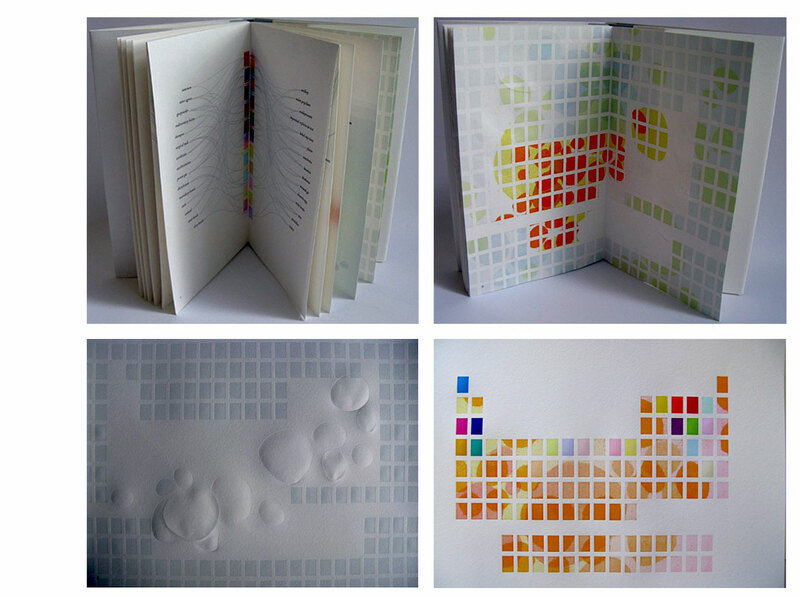 The figures are each numbered and can be interpreted using a booklet containing an alphabetical and numerical index, as well as a short essay by David Allen about our process and the source of the data. The design of the enclosure encourages the viewer to layer the forms to create different combinations of shape and color. 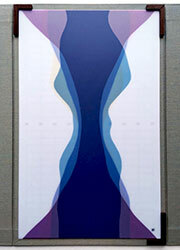 This process and the resulting imagery is initially reminiscent of elaborate dresses, paper dolls, and dissection plates, but the source of the data gives a different picture, laying bare the vast and critical differences between the basic equations of life in different parts of the world. "Although we carefully graphed all of the available information, it was initially collected using a variety of different methods. The data is a combination of accurate reporting, biased self-description, out of date or incomplete reports, and best guess projections by Census Bureau demographers. It is a flawed narrative drawn from our combined and often conflicting desires to give a truthful and exact account and to tell a story about ourselves. In this way, Figure Study is similar to any self-portrait, conveying alternating moments of accuracy, optimism, and humility."